Aafrah by Sakshi & Shalki is a small but stunning store in Shahpur Jat that does gorgeous organza and Chanderi silk suits, saris, cotton pallazos, blouses and lehngas sets too. What I love about them is that while they do a lot of bright and blingy clothes, none of it is ever OTT. As someone who only prefers stocking up on pastel-coloured wedding wear with barely a few bright blues and maroons in my wardrobe, I felt that all of Aafrah's clothes were very tastefully made. 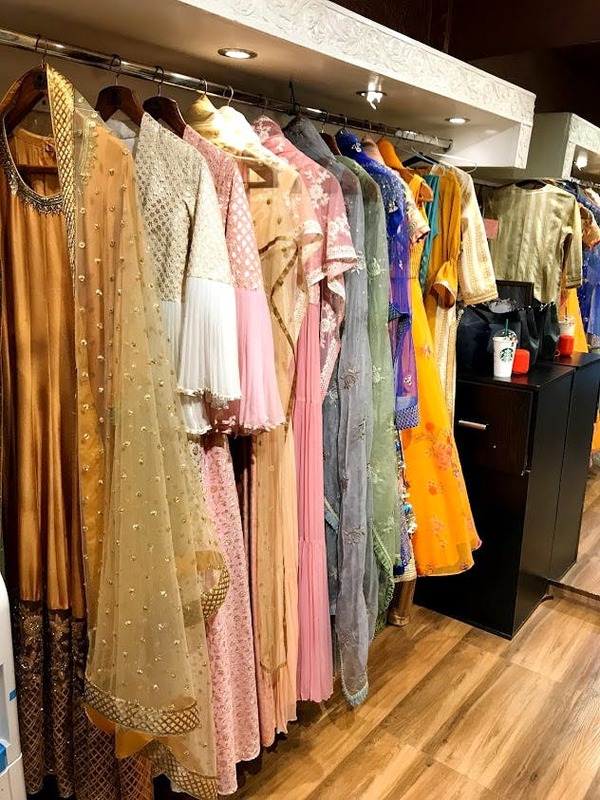 When I visited the store, their collection included bright silk kurtas, teal organza kurtas with golden embroidery, cotton kurtas in yellows and oranges, and floor-length anarkalis with delicate embroidery. I particularly loved the rani pink kurta at Aafrah that came with peacock embroidery and a baby blue duppatta. It's a great outfit for smaller functions like mehendi/haldi. In case you're looking for an outfit for your best friend's wedding, choose from their designer collection of lehngas that start at INR 12,000 (also for suits) and can go up to INR 55,000 for the heavier sets. Apart from suits, saris and lehngas, they've also got interesting Indo-Western pieces like pallazzo and blouse sets that come with breezy cotton jackets. These sets of three are priced at about INR 25,000. While most of their stuff is reasonably priced, they do stock suits and saris which I felt, were a bit expensive. Also, if you're looking for cotton/linen type kurtas, Aafrah will have relatively fewer options to offer.